The Eighties saw more than its fair share of musical styles, what with New Romantics, House, Sound Sample Mixing and several others. Much of the reason for this was the advances in music technology which brought us the synthesiser keyboard, and so was born Synthpop, and one of the biggest proponents of that particular style were Erasure. Erasure were a double act comprised of Vince Clarke and Andy Bell. Whilst Bell was the exuberant front man it was actually Clarke who was the initial driving force behind the group. 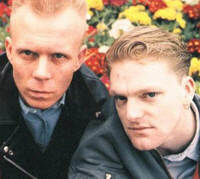 Prior to starting Erasure Clarke had been a member of several early eighties bands including Depeche Mode, Yazoo and The Assembly, but in 1985 he placed an advert in Melody Maker magazine and chose Andy Bell from the many applicants to fill the position of vocalist. The group’s first releases failed to set the UK charts alight however, although they had some success with Oh L’amour, their third single, in Australia and France. Their next song changed all that though. Sometimes made its way to number two in the charts and this helped propel their first album, The Circus, to number six in the album charts, which eventually went platinum. The band went on to produce some very memorable tunes, including Chains of Love, A Little Respect and Stop! but ironically despite doing well in the charts they had to wait until the early nineties before they finally got a number one spot, and that was with a mix of Abba covers! One interesting little nugget regarding the creation of the music tracks for Erasure’s songs is how they were sequenced, which is the way in which several synthesisers can be controlled at once to play the different tracks. Vince Clarke surprisingly used a BBC Micro to do this job, even many years after that particular computer had ceased production! The duo of Clarke and Bell are still together today, and have released remixes of some of their hits during 2009, leading to a remastered re-released of their album, The Innocents, which is due out on October 26th 2009. They are also currently working on an album of new material. This entry is filed under Music - Artists	and was posted on October 21st, 2009. You can follow any responses to this entry through the RSS 2.0 feed. You can leave a response, or trackback from your own site. Vincent is a hero of mine..I saw the reunited Yazoo a few years back and was beside myself with excitement when he got together with Martin Gore to create the VCMG album. Erasure’s pop, strangely, hasn’t always dated that well compared to his Depeche output (I’m sure plenty of fans would vehemently disagree). Still a legend. Only thing I will say though, is that his Tweets (I get them on FB) tend to be about his dinner (!). The Circus was their second album. Their first was called Wonderland and was the album Oh L’Amour was taken from.